Lyrawa Bay, Battler and Red Empress astern of Sealand Performance 10 June 2009. Just coincidence (does anyone know)? 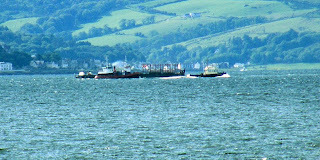 BATTLER had been running stores out to the tanker ROMANTIC anchored in Irvine Bay; RED COUNTESS, the barge and LYRAWA BAY have been involved in removing fuel oil (I think) from SEALAND PERFORMANCE.